Madison residents aim to craft a grand vision for the Oscar Mayer site | Vandewalle & Associates, Inc.
EXCERPTS FROM ISTHMUS.COM: Residents and officials are contemplating how the 72-acre Oscar Mayer property could be redeveloped and connect with the north side. When the last slices of ham slid off the production line in late June 2017, it marked the end of Oscar Mayer’s 98-year legacy as one of Madison’s most prominent economic assets. At its peak in the 1970s, the facility provided some 4,000 jobs to the community. By the time it closed, just 640 employees worked there, 73 percent of whom were Dane County residents. 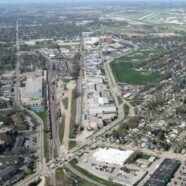 In 2017, the Common Council established the Oscar Mayer Strategic Assessment Committee to oversee a framework for redeveloping the site. The 15-member committee, made up of city officials and community members, is charged with evaluating the neighborhood’s assets, needs and investment possibilities. It will then recommend a plan for redeveloping the site. In a report provided to the committee, consultant Vandewalle & Associates identified different opportunities it sees for the site, including development as a food manufacturing and distribution center, advanced robotics manufacturing facility, multimodal transportation hub and a corporate campus. But those involved in the project caution that these are just ideas and that ultimately, the property owner makes the development decisions. (In October of last year), the Reich Brothers Holdings purchased the 1.7-million-square-foot facility from Kraft Heinz for an undisclosed sum. For some, this outside investment is an encouraging sign that the 72-acre site will be redeveloped in a way that benefits the greater Madison economy and community.